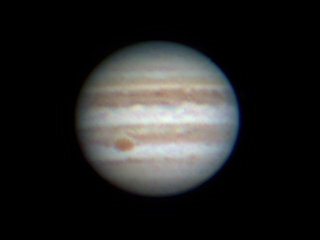 Here is a view of Jupiter from my front yard taken on May 30, 2017. Seeing was average so the image is not as sharp as others I've taken. Optics 120 mm SkyWatcher f/7 Esprit 120 APO refractor using eyepiece projection with a 7 mm Nagler eyepiece. Processing Stacking done in AutoStakkert. All post processing done in images plus.